A friend of mine (who wishes to remain anonymous) shares my interest in finding swipes of famous illustrators and comic book artists. Neither of us begrudge these artists for swiping (that's the comics industry term for using reference material perhaps a bit too faithfully). After all, these artists worked under brutal deadlines and sometimes they had to cut corners to meet them. "One of the great swipes," says my friend, "is Jack Kirby swiping a Hal Foster image and turning one panel that became an entire comics series and an integral part of the standing DC Extended Universe." "It appears that when Steranko painted the covers for the Shadow reprints, he swiped this cover from Spicy (Speed) Detective. The original artist was Hugh Joseph Ward and the periodical was Speed Detective June, 1945. 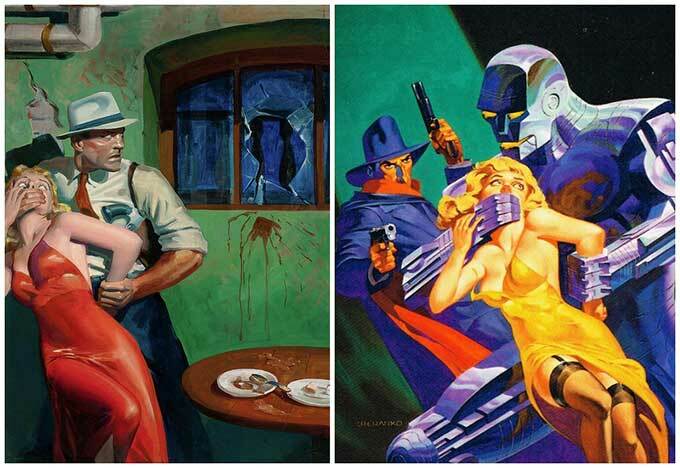 "The image below is more the norm: Steranko being swiped himself. Here Williams' pinball machine "Blackout" swiped Steranko's famous Nick Fury Agent of S.H.I.E.L.D issue number 6 cover for its scoreboard art:"
UK animator extraordinaire Cyriak Harris posted a side-by-side animation of two herds of dancing cows. Harris' cows are on the right, McDonalds' are on the left. I'll bet McDonalds didn't know that they'd hired a rip-off ad agency. Top: Detail from "Les Porteurs de Mauvaises Nouvelles," by Jean-Jules-Antoine Lecomte du Nouÿ. Bottom: Detail from "Conan the Destroyer," by Frank Frazetta. I'm not opposed to swipes. I like them! I look forward to the inevitable comment that comes with my posts about interesting swipes: "It's just a coincidence. There are only a limited number of poses a human body can make, and this is a common one."